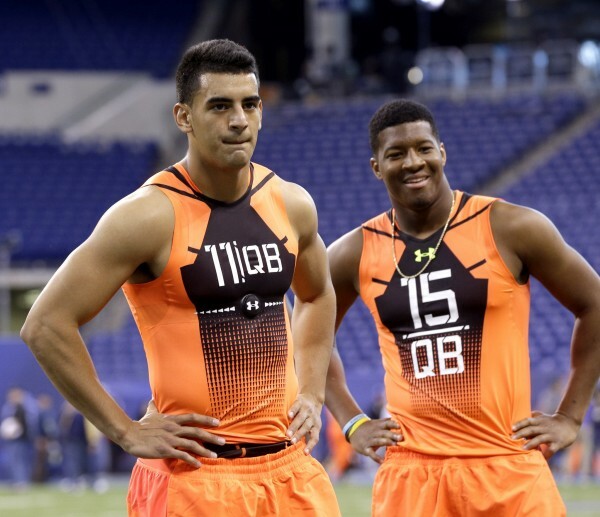 There are a lot of things to look out for in the NFL combine, but the presence of quarterbacks Jameis Winston and Marcus Mariota is obviously getting most of the attention, and the two lived up to their promises both in action and more or less in performance as well, which means the weekend of “feats” isn’t going to hurt their prospects of being a high draft pick and a big contract that comes with it. Both players showed good, impressive throwing motion, were quite accurate on the deep ball throws and didn’t have a problem with any of the drills. There was some concern raised over Winston because of a shoulder issue, but despite some advice (no one asked for) from anonymous scouts to stay away from any throwing drills for Winston, the 2013 Heisman winner went ahead with the schedule and didn’t look too bothered with whatever pain he might be feeling. Mariota looked good throwing, but the most impressive thing about his combine performance was his athleticism. He ran a 40 in 4.52 seconds, faster than 10 of the wide receivers who ran their workouts on the same day. He also displayed a 36-inch vertical and 10 foot, 1 inch broad jump. His 40 time was the fastest among all 15 quarterbacks taking part of the combine. Garrett Grayson of Colorado State is the only one among the top quarterback prospects to not participate in the workouts due to a hamstring injury. Jameis Winston and all of his 231 pounds didn’t turn any heads with his 40 time, running a 4.97 and 4.99 to go with a 28 inch vertical and a broad jump of 8 feet and 7 inches. But Winston is looking like the top quarterback prospect and maybe the number one overall for his ability to throw the ball and manage the game, not for his speed. Any off the field issues he might have had during his Florida State days don’t seem to be too much of a concern; it’s his ability to remain calm in the pocket and under pressure that is what general managers are after. Mariota worked in a system that allowed him to have big numbers, but might also skew perceptions about how good he really is. Right now, despite his very low interception numbers throughout his career and especially this season, he’s been viewed as the second best quarterback in this class. He isn’t a case of someone teams are slightly afraid to touch like Johnny Manziel was a year ago, but he might not be the franchise quarterbacks the lowly teams of the NFL are looking for according to buzz from the scouts. The top two teams are both on the lookout for a quarterback which means we might have a 1-2 situation with Winston and Mariota like we had with Andrew Luck and Robert Griffin III in 2012, but there are other things to consider – teams needs pass rushers and offensive linemen as well. There are at least two more teams in the top 10 besides the Buccaneers and the Titans glancing at taking a quarterback with their first round pick, being the St. Louis Rams and the New York Jets.